Wisconsin #24: What a difference a cold night makes! In the last post, it is late evening, and my view is upstream from one of the better access points I have found. THIS is the view downstream the next morning. 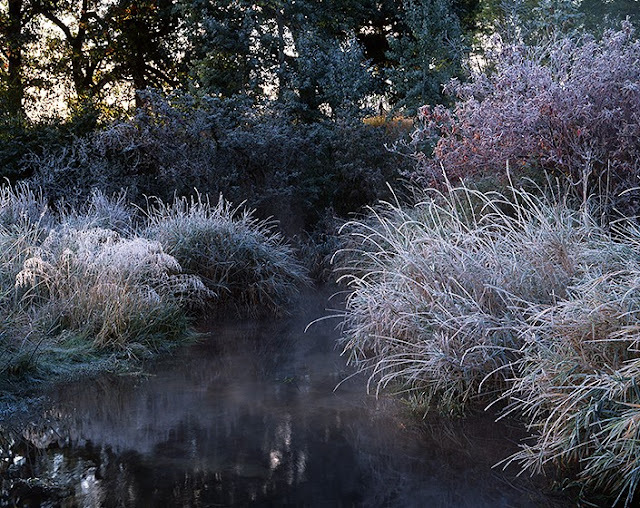 Steam rises from the water, as it is warmer than the air, and when it touches the sub-freezing blades of grass, it crystalizes into a frost almost immediately. However, I only get to see this because I am on the dawn-patrol. The morning sun is just starting to filter through the trees, and as quickly as the frost has been created, it will be vaporized, disappearing at the touch of the first warming rays. This ethereality of this image has always beckoned me to ask, “where does the river flow,” as a kind of meditation, but in reality, the river flows off-property to a large lake that hosts another niche ecosystem, and hundreds of ducks, geese, and swans. It is only about a 1/4-mile from here, so we will walk over to this lake for the next post. Stay tuned! Wisconsin #23: There are only a few places along the edge of the stream that actually offer access and a POV. As proven in the last post, vegetation near stream is very dense, and even when I find a way through, tall grasses line the shore embankment. Once here, however, the quite sound of the flowing water, the play of light, and the constant conversation of birds of every description, make for a great place to just sit and watch time pass. This residency, and the one I have also been offered at Sundance, both deal with landscapes concentrated in relatively small areas. As a result, with less territory to explore, I get to re-visit many things again and again, and I learn to appreciate how much they change through their various seasonal manifestations. The sitting and watching is as informative as exploratory searching. They both reveal things, just in very different ways. Eliot Porter taught me to see color created by intense line detail, and to view the “ordinary” as extraordinary. Aldo Leopold’s words asked me to appreciate the “everyday” parts of the natural world, and not just the monumentally obvious. This Waukesha residency brings all those thoughts together while I wander and ponder this terrain of the Kettle Moraine. 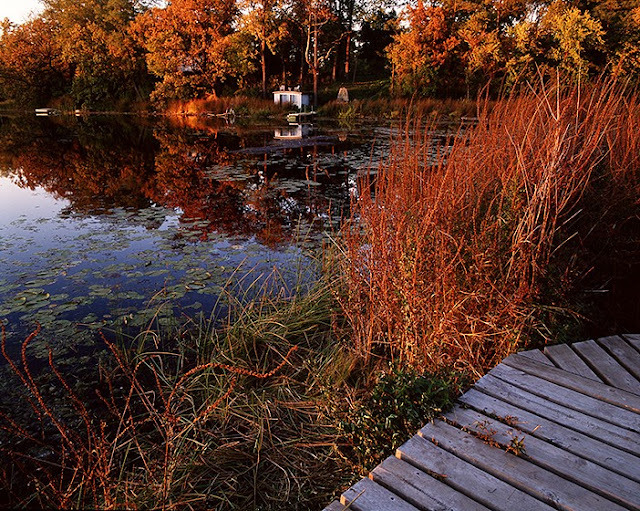 Wisconsin #22: Of the many niche environments of the University of Wisconsin-Waukesha field station, the “weediest,” most diverse landscape is where the stream flows through to the lake, not far away. River’s edge is a confusing, dense hodge-podge of grasses, oaks, sumac, and numerous wildflowers, all of which are growing over, and through, each other. Sometimes vegetation at stream-side is so thick, I cannot tell where the actual stream side is, until I nearly step off the bank into the water. The water is hiding in this image, camouflaged cleverly by the confusing light scatter of the setting sun. 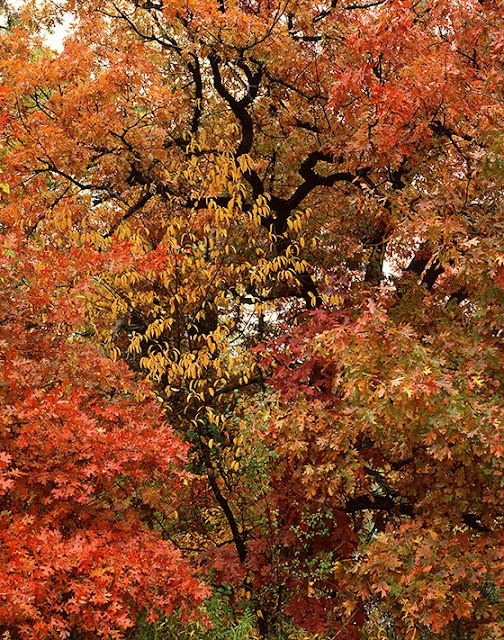 Nonetheless, it is here I am always attracted because it is just teeming with color, texture, and myriad forms of life. There is always an image to be made. Familiar spots appear completely differently from season to season, but regardless of the change, they always seem to offer a show. Wisconsin #21: My NEA residency in the Kettle Moraine of Wisconsin, only covers two fall seasons, and once I discover the graphics of the early morning frost, I want to take as much advantage of that seasonal phenomenon as possible. For my host, Marlin Johnson, that means I am probably awakening him with my dawn departures, but he loves the images, so he tolerates the disturbance. On truly cold nights, EVERYTHING at ground level gets frosted, sumac, grasses, and the lower branches of trees. Then, when the sun rises, it disappears VERY quickly in the first of the sun’s rays. My initial experiences making pictures are frustrating, because I have images evaporate before my lens, while I am trying to complete a shot. Eventually I learn to work in the shade, at the edge of sunlight, which often gives me the best of both worlds. I hope my variation on the theme of “lighting and weeds” is still visually interesting to you. Wisconsin #20: As previously stated in this blog, the beauty of working on this relatively small property is that I become VERY familiar with all of its subtleties and nuances, AND that I visit the same subject numerous times over many seasons, so I see how they change and evolve. 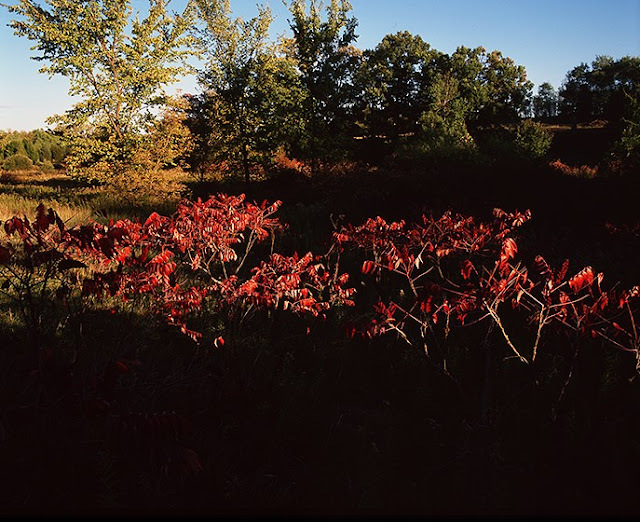 My last two posts have been observations about the play of light in the swale of sumacs nearby the farmhouse in which I am staying. Often, however, when you revisit a location you know, unexpected things happen that add layers to the strength of whatever images you might be hoping to make. 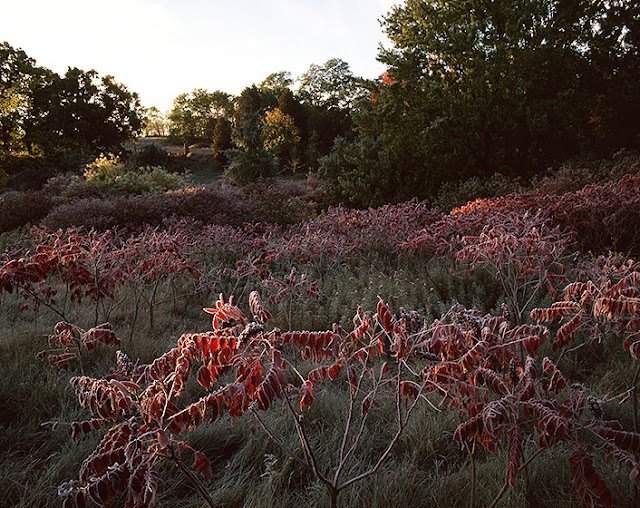 This morning, it is a hard frost that decorates the red fall leaves of the sumac. I discover this event is TRULY fleeting, because the frost evaporates as soon as it comes into full sun. Fortunately for me, I woke early, got outside before the melt started, and found this sea of red leaves, bedecked with crystals, and delicate spots of sunlight. By 9a.m. it is 75˙ and windy. The ephemeral beauty of this is long gone. Wisconsin #19: The swale of sumac on the University of Wisconsin-Waukesha property, where I am serving my residency, puts on a show in all seasons, but in fall the red sumac leaves are a vivid signature in the landscape. 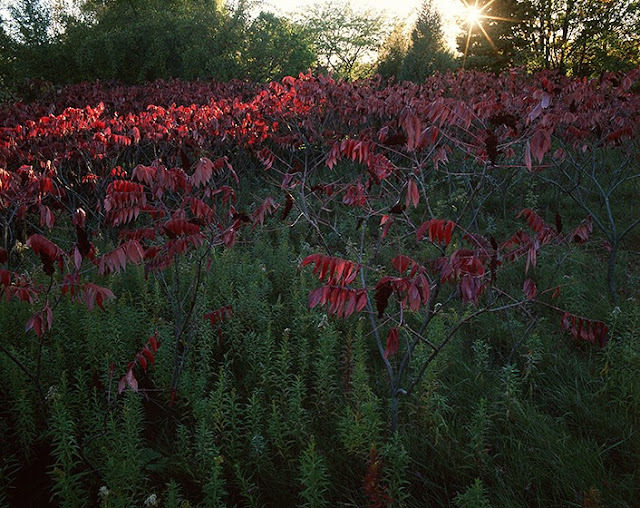 Not far from the house in which I am staying, I can, quite literally, stumble out of bed, and into the sumac meadow. In the last post, I was using the soft light of late evening, allowing you to see the understory. Here I have the reverse. Having stumbled out of bed, I confront the first angled rays of the morning sunlight. 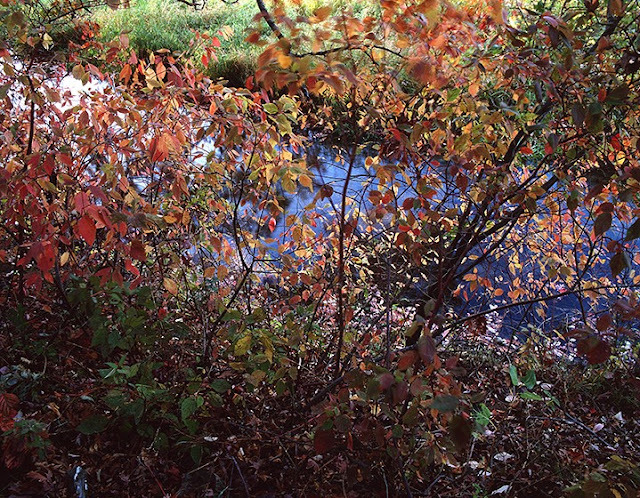 In my photographic experience, color is enhanced by a “foil” in part of the image. That is especially true here with regard to the blackness of the shadows, and the visual response we have to the red leaves, which seem to get redder against the deep black background. 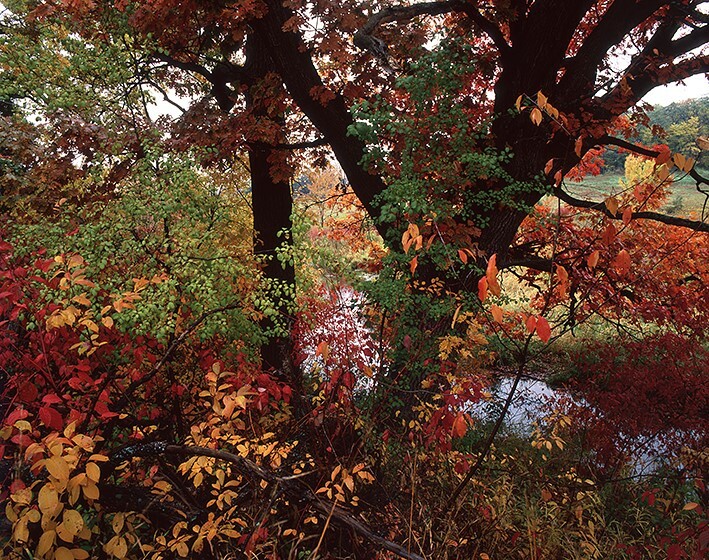 I discovered the visual deviceof having a foil, while working in the Hudson River, and one of the most notable images in my career, post #138, uses a rain saturated tree trunk, turned nearly black, to offset the astounding fall display of color around Lake Cohasset. Being aware of the foil in making a picture, helped me to craft some of the most striking images in my portfolios. Wisconsin #18: From one group of “weeds” to another, here is a series of images playing with the light, and my object of obsession this time is an invasion of sumac. 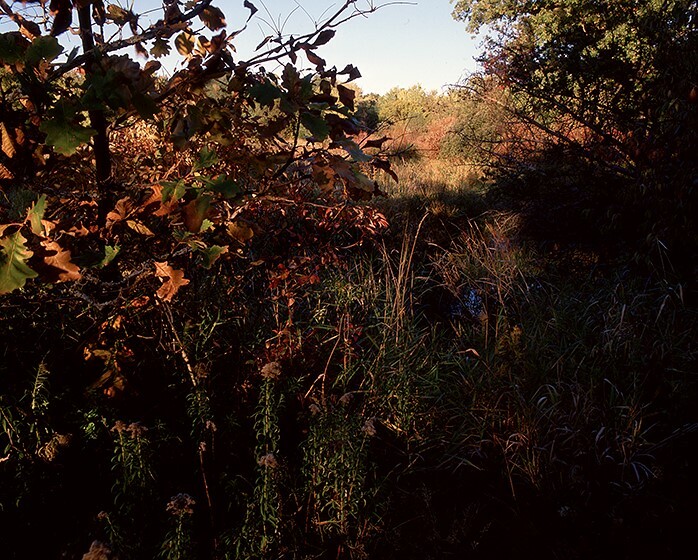 Over my two years of this residency, this densely vegetated swale, put on a greatly varied display of light and color, especially on the cusps of the day, when the angle of the sun was low. Here, it is late afternoon, and the sun is beginning to set. The last rays this slope will see, dance across the tops of the leaves, as the sun passes behind the distant trees. The filter the trees provide, along with the haze of atmosphere, allow me an exposure that is directly into the sun, AND STILL you can see the details and colors of the undergrowth in shade. This “stretch” of exposure range is less difficult now with digital technology, but for film, this could only be accomplished by fully appreciating the nuances of light and contrast. Thank you, Eliot Porter! Wisconsin #17: I have not moved my POV very much from the last shot (previous post), but now I am dealing with, what are truly the last rays of sunlight. It has been windy all evening, but the light is such a spectacle playing off of the tall waving grasses, I stay to the last minute, regardless of the motion. I started “playing” with the wind and time exposures, early on in my work on the series, ORDER FROM CHAOS. At that time, I had some real “issues” with wind, because I was shooting with a 4x5 camera, which made my exposures even longer, more blurred. As a result, I often took pictures with wind motion, as there was little else I could do. In this residency, I am using a Pentax 6x7, a camera that gives me “view camera-esque” film size, but has 35mm field capabilities. I can play with variations of exposures more quickly,..well, most of the time. This particular moment of light only lasts about TWO seconds, the length of ONE exposure, and then the sun is down. The vast grasslands of the Buffalo Nations must have been an amazing thing to see, in the changing light and weather of the day. 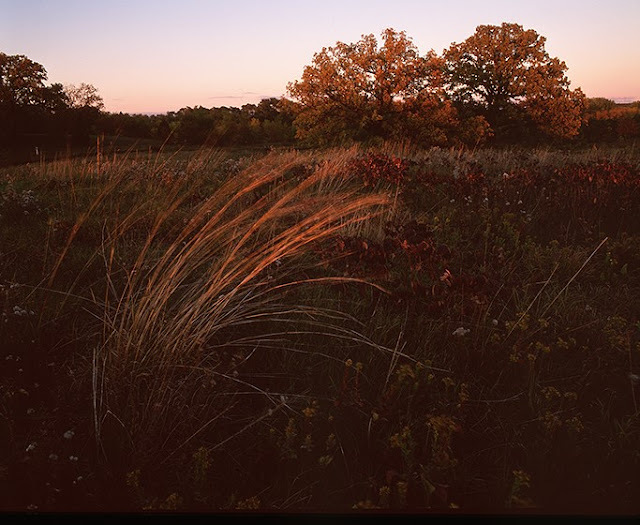 Wisconsin #16: Same field of grasses as the last post, but a VERY different light and color. In the previous image, the sun is coming up on a clear morning. The shadow/highlight relationships are harsh, and the color-pop of the illuminated grass, is yellow and gold in tone. In the image above, you are looking at the last light of the day. Although the sky appears clear, because of humidity, there is a haze of moisture at the horizon. As the sun sets, and its rays pass through that vapor, their tones soften and warm into red. It is still quite a windy day, and this is just a lucky moment where everything appears to be motionless. There being nothing in the picture but “weeds,” it is clearly the beautiful glow of the last few rays of sunlight, that give this image its impact. Again, I hope you will scroll between this post and the last two to see how much the change of lighting affects color and tonality. Wisconsin #15: As the last post was the softer illumination of the setting sun, this one is bright, clear, morning sunlight, before the humidity of the day starts to build. Compared to the last post, these highlights are more brilliant, and the shadows more deeply black, with much less detail, and very little color subtlety. You can also see the the prairie wind has not started as yet, either. 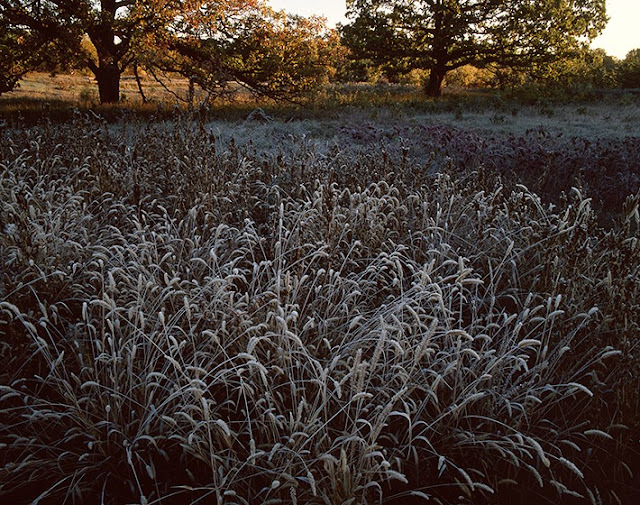 The intention of this residency is for me to photograph the restoration work being done with native grasses in an oak savannah, but daily conditions offer me much more. For the most part, my principle subject is “mundane” and repetitive, but the light and the passing weather change that every time I venture into the field. Between frosts, rain storms, wind, and an amazing variation of light and color, these wavy, graceful “weeds” put on a constantly changing show that is anything but redundant. Wisconsin #14: These next few images are going to be about grasses in varying illuminations. Besides the nearly constant midday winds of the prairie, once you are east of the Rockies, there is also significantly more humidity in the air. It tends to build during the heat of the day, and is most apparent towards the end of the day, as the increased water vapor in the air affects the sunlight, making it softer, less contrasty, and of a warmer coloration. Often the winds dies down as well. In this image the sun has nearly set, and you can see the warm tones of the late light washing over the distant field. If you look at the last post, or intend to view the one next week, you will see midday, and early morning light is brighter and more harsh. The range of contrast is MUCH greater than you see here. Because the wind has dissipated, I can record these graceful fronds without motion blur, BUT because this is SOFT, late evening light, I can also shoot from deep shade, into sunlit areas without washing out highlights, or causing the shadows to become so dark, subtle coloration is lost. Once all three of these posts are online, scroll between them and look at the variation of brilliance in the highlights, and the depth of black in the shadows. Wisconsin #13: I previously stated I would use this particular blog, to revisit advice I would give in my teaching workshops. 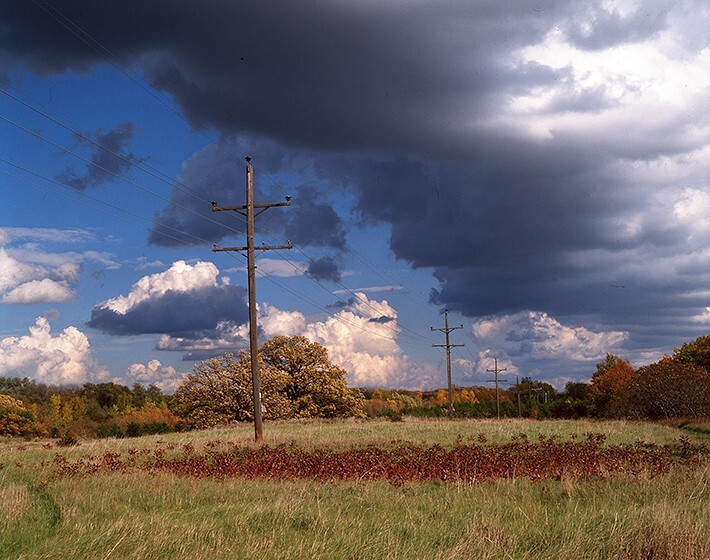 In the last post, I showed a similar image to the one above, and suggested I found the telephone pole of interest, because it placed the landscape in a rural environment, not a “wild” one. Admittedly, in that image, the telephone pole is barely visible. With that shot in-camera, I realized I wanted the pole as part of the image, and in fact, I wanted it to be a more visible part of the image, so I began walking towards it, stopping at various intervals to re-frame the collective subject on my ground glass. When I arrived at the POV above, it all seemed to fall nicely into place. The pole is even more pronounced, not just because I am closer to it, but now the sunlit pole stands out strikingly against the dark tree shade behind it. Wisconsin #12: In posts #5 & 6, I have shown you this before as well. 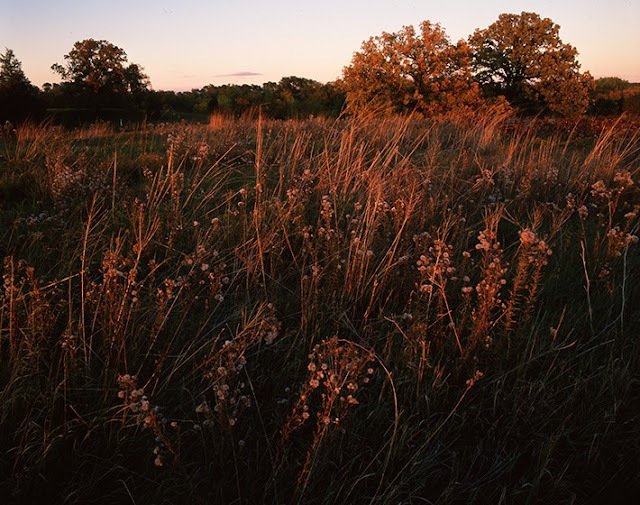 This grass savanna dotted with heirloom oaks is the majority of the property, and where the restoration work is being done. It offers more expansive views, and it has an excellent alignment with the available light of morning and evening. Other than that, it is relatively the same place on any visit,..or is it? Of course it changes with the seasons, but through my repeated visits, there are other touches I have come to appreciate. 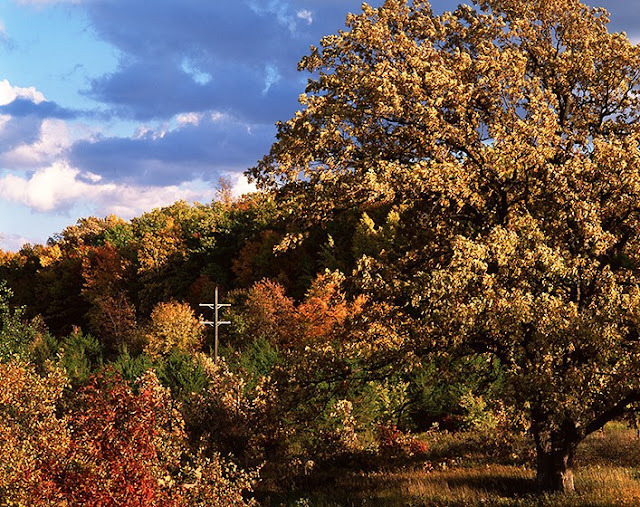 When you look a post #6, it is a very similar view to this, with more emphasis on the grandeur of the foreground tree. The POV, however, obscures two details in that picture that I fee add to this image in small but important ways. This IS a rural area. It is not “wilderness” land. It is quite domesticated. The evidence of that is in this shot, although somewhat hidden. In the middle-left of this frame is a tiny, white rectangle. That is a bird-nesting box and there are MANY of them on the property. Just slightly above the birdhouse, beyond the radiant golden oak, you can also see a telephone pole, part of the line that runs through post #5. 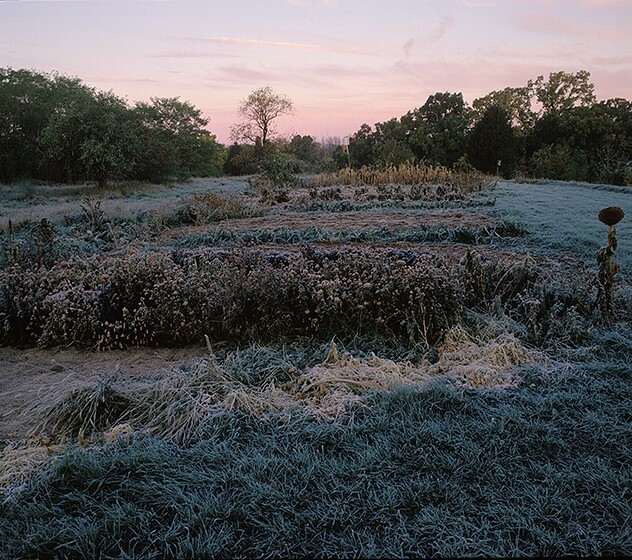 Wisconsin #10: All my previous work in the landscape involved relatively large areas. My first portfolios, “WINTERS: 1970-1980” and ORDER FROM CHAOS spread across multiple states. That has been followed by the Hudson River, the Tongass rainforest in Alaska, and the Cuyahoga river valley in Ohio, stretching between Cleveland and Akron. Now I am here in the Kettle Morraine, a very different kind of subject, AND a much smaller territory to address. This is also a location that has no monumental vistas, or formations. This is just a broad field with lots a grasses and other native vegetation, some majestic oaks, and there are lush banks around the creek that flows through. That is about it. If you read my other blog stories, most of them dialogue about the adventure of the trip. This blog is different in that there is no adventure story to relate, so I am going to use this more like a device to support my long history of teaching photography workshops. To start with, for those of you who have taken my workshop, you know I downplay camera tech, and prefer to talk about how one “sees” through their camera. As proof I practice what I preach, in this, AND 90% of ALL my blog pictures, you are looking at a “full-frame,” in-camera image. In printmaking, this is exactly what you get as well. There is nothing included, or excluded, that I don't intend. 4x5, 6x7, 645, and 35mm, all of them, ALWAYS shot full-frame throughout my career. Wisconsin #9: If you are not out in the native prairie-oak savannah, or down by the stream where the vegetation has “run wild,” you find yourself in the interesting bio-zone, in-between. Lots of different things live here. There are a lot of young, deciduous trees, and tall rangy bushes. There are also a lot of things that have thorns, like wild grape. There are flying insects in profusion, and there are ticks to be wary of as well. We often check each other, when we come in from a day in “the field.” To keep the sharpness and detail that I want in these images, wind works against me, so most of what I am doing is on the more windless cusps of the day, and during/after rainstorms. What I find as a result, is many images play with the light/shade relationship in my field-of-view, but that relationship causes new color relationships as well. In the deep shade (early morning, above) colors trend into remarkable tones of blue and purple, and where there is sunlight, things are affected by warm tones. 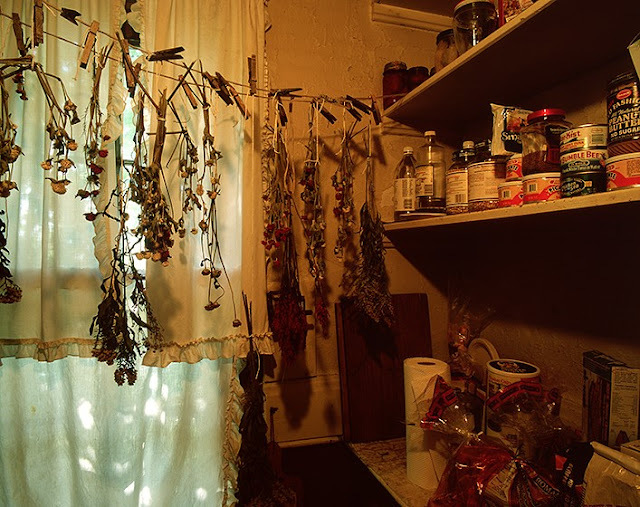 For me this is light/color play I used in my portfolio, ORDER FROM CHAOS, but in this body of work, I am trying to express an actual subject's diversity. It is not intended to be as abstract as work from that portfolio. Wisconsin #8: On most days, the winds have picked up by midday, and on some days they are howling. At other times they come with thunderstorms, which is a good time not to be the tallest thing around. I find myself working the dawn-dusk hours, because the weather above the prairie is at its most quiet moments. 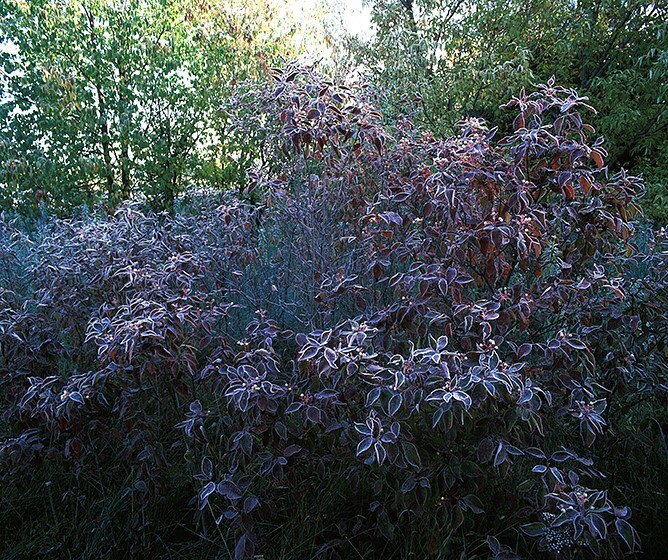 The early days of fall bring light frosts that become progressively heavier as the days wear on. 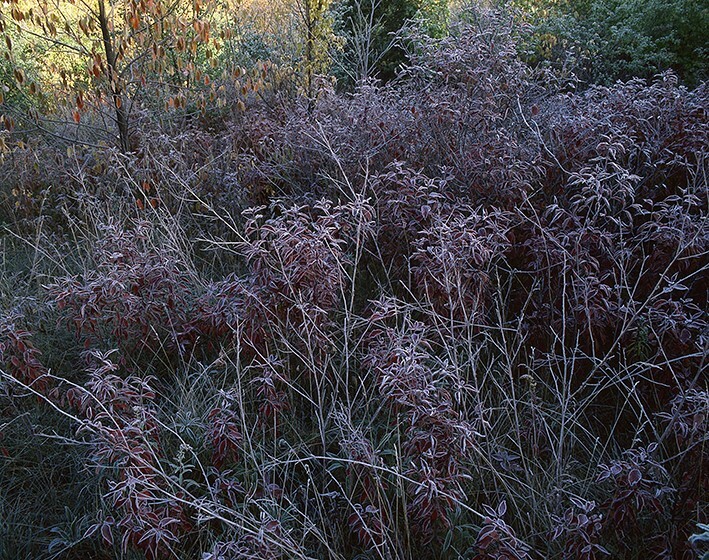 The shades of color in the fall grass, and the highlighting of the ice crystals is beautiful, and very fleeting at first, melting instantly when struck by sunlight. 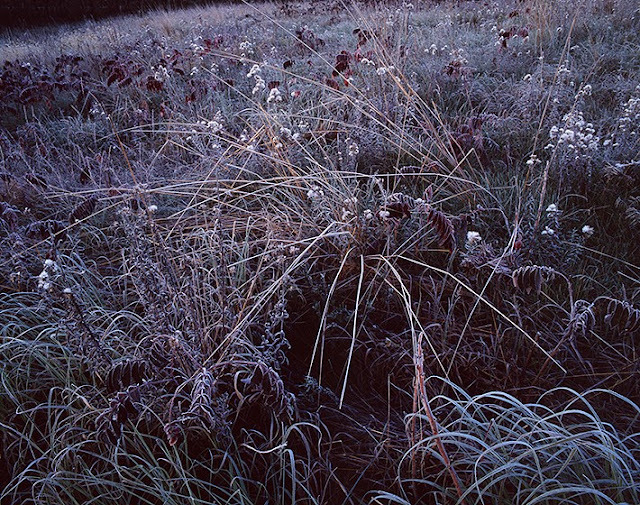 Over time, however, the frost is heavier, stays on longer, and begins to bend everything down to the ground, where they then will likely be blanketed by snow. 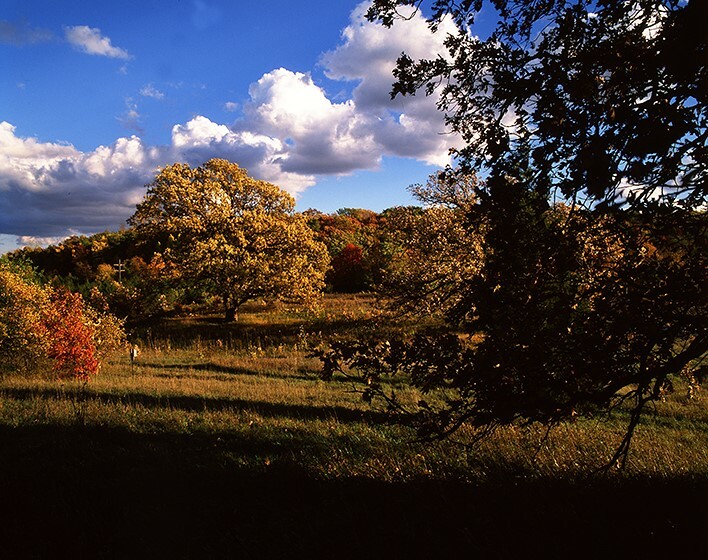 Wisconsin #7: The location of this field station puts us in a topographical feature know as the Kettle Moraine. 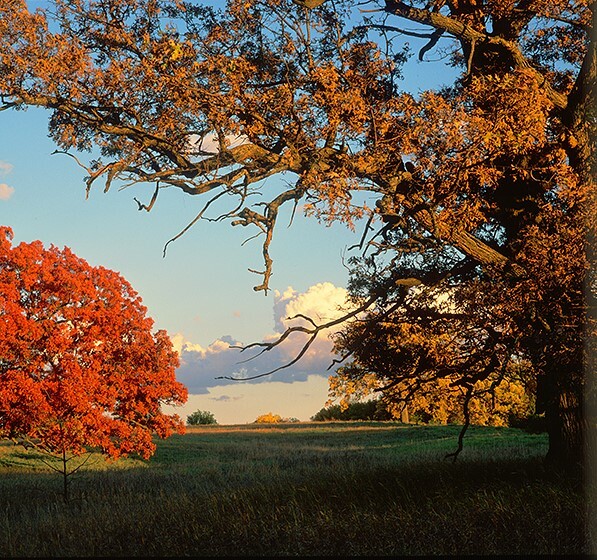 The Kettle Moraine covers a good deal of the state of Wisconsin, and was created by the last glacial retreat. As the glaciers melted back, glacial rock debris was left, covering unmelted ice beneath. That ice eventually melted as well, but more slowly, and at different rates in different areas, creating a “pothole” landscape. Those potholes can be as small as ponds or lake-sized, and most connect to one another through a myriad of streams. Near the field station, where I am “in-residence” as an artist, there is a large kettle lake that attracts a lot of wildfowl. It is not on the property of the field station, but streams feeding into it, do cross our acreage, representing one more distinct feature of this habitat. Least used and visited, this part of the property is “running wild,” and I find it riotously beautiful. Wisconsin #6: 92 diverse acres is a lot of room to wander, but it is also a small enough area to visit all parts of it several times a day. My time is spent in early morning walk-arounds, some food, then students arrive. If I can make use of midday, I go for another walk, and generally I am always out at dusk until it grows dark. The early morning and late evening light are clearly part of the show I am supposed to take in. 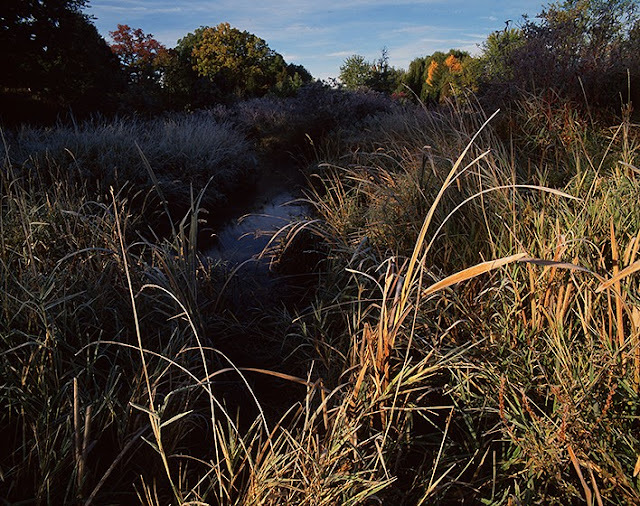 The angle of the sun not only sets off fall colors, it articulates individual grass strands, and it puts rainbow prisms in the early morning frosts. Those hours are also times that seem most windless. Early mornings before sunrise are often dead-still and bedecked with icy crystal designs, that quickly disappear as the sun warms and the breeze picks up. Wisconsin#5: The daily weather at the field station is generally dramatic, but it makes my picture taking difficult because it offers up extreme lighting conditions AND a lot of wind turbulence that really whips the grasses about. On many days, it becomes dangerous to be in the grass savannah because of exposure to lightening. As a practical matter, I become very good at protecting myself from wind chill, and shielding my tripod-mounted camera from wind gusts that might shake it, or knock it over. I also discover using some ski gear is useful if I expect to walk in the waist-deep vegetation. As a cross-country skier, I always wear snow gaiters to keep my boots dry, and to prevent snow from getting in at the ankle. Here in the native grasslands of Wisconsin, using those same gaiters also keeps my shoes dry, but more importantly it keeps insects out of my pants legs, and a gazillion burs and thistles out of my socks. Wisconsin#4: Although there are many interesting, and sometimes curious, things going on in the various farm buildings of the University of Wisconsin-Waukesha biological field station, the real show is outside. 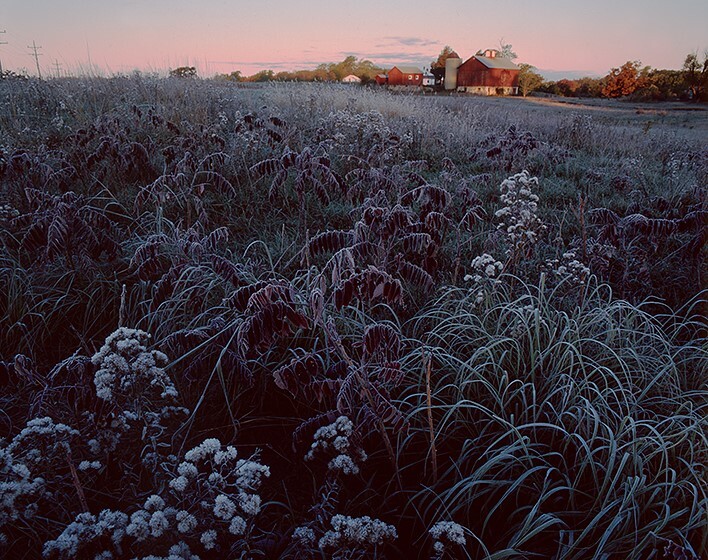 The 92-acres of the farm hosts a very diverse landscape, from domesticated plantings (above), to native prairie restoration areas dotted by massive oaks, and meandering streams of the Kettle Moraine, where a plethora of grasses and vegetation are supported by the watercourse. The student-maintained garden above grows vegetables, as well as serving to raise specific seed species for the native grass restoration. You will probably note that many of these pictures are early in the morning or late in the day. That is not just because the light is great, it is also because this is the open prairie of the Midwest, and as the day passes, the weather and the winds build and churn the skies, putting everything on the ground into motion, especially the gasses. 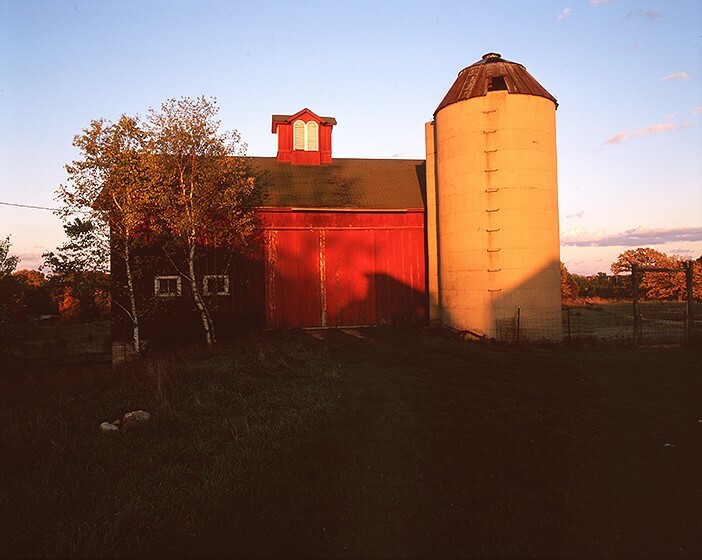 Wisconsin#3: The farm/field station that Marlin Johnson cares for on behalf of the University of Wisconsin-Waukesha, is a cluster of buildings. Besides the house, there is a large barn, a grain silo, a sizable chicken coop, some mechanical sheds, a big kiln, and a large greenhouse. I will learn that there are always things going on at the property, and especially in the greenhouse. The students propagate seeds here; the harvested crops store here; many of the dried specimens are also displayed here. On this particular fall day, it is cold and windy outside, but the greenhouse quite cozy. 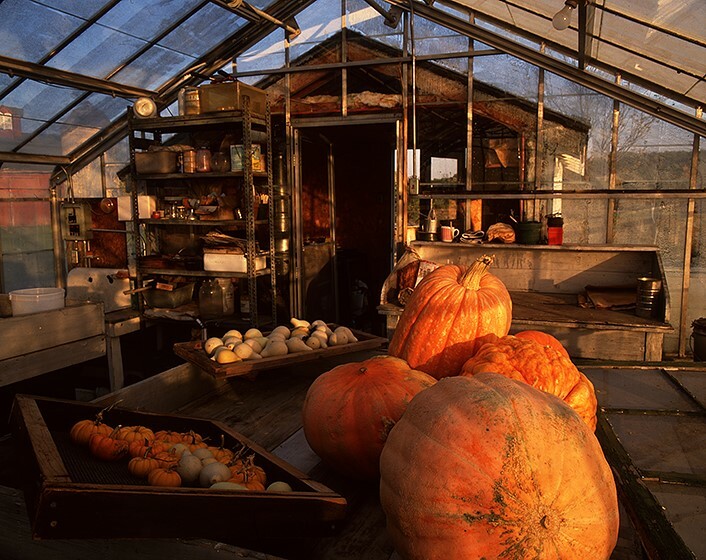 I could not help but take this picture of harvested pumpkins sunning themselves. Soon they will have spooky faces, and we will all be eating pumpkin pie! Wisconsin#1: By 1988, my Aperture book, The Hudson River and the Highlands, has been published and is a critical success. The related exhibit travels, and also attracts attention. I am in the middle of a project in Alaska involving the Tongass rainforest, and I have also been commissioned by the Akron Art Museum in Ohio, and the National Park Service, to photograph the Cuyahoga River valley which connects Cleveland to Akron. In the midst of all this, another offer appears. I am contacted by Marlin Johnson, a field biologist teaching at the University of Wisconsin-Waukesha. He is leading a unusual project in a very unique habitat, and he wonders if I would have interest in photographing what he and his students are doing, and the area. 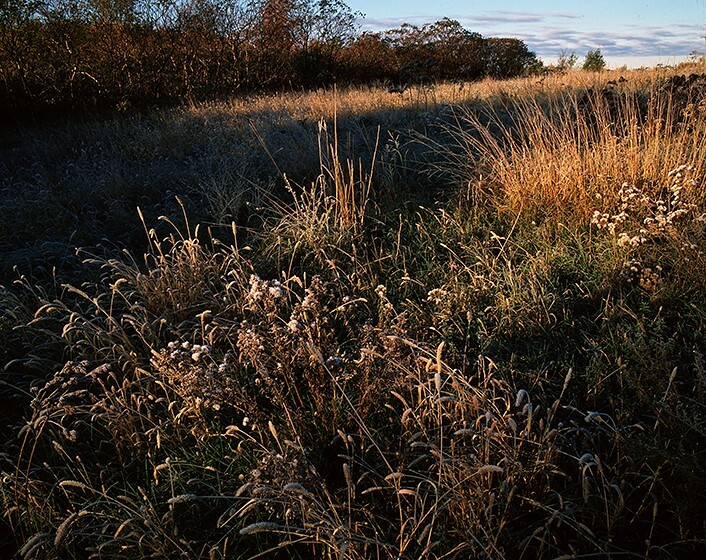 His classes are held off-campus at a field station in the Kettle Moraine, and there they are trying to reconstitute the ecology of a native prairie. The property originally was a private 92-acre farm, owned by Gertrude Sherman, who donated it to the university to be used and maintained as a field station and preserve for educational use. The complex is quite nice, consisting of a big barn, a grain silo, a large chicken coop, several “machine” sheds, a large, wood-fired kiln, and a nice, comfortable farmhouse. Marlin lives on the property, and I would stay there, when visiting.